At the height of about eight meters, windows are placed horizontally in succession on the residence of the owner. The premises is located in quiet neighborhood about 10 minutes’ walk from the station through old shopping street. It has a narrow frontage but long curving strip of land stretches behind the house on the west side. The vicinity is designated low-rise building residential zone / neighborhood commercial zone and crowded with two to three-story houses. Buried among the crowded roofs of houses in the neighborhood, the height of sight line from the residence of the owner can be compared to that of a water-bus or a ferry which cruises on choppy water. Roof of the owner’s residence is shed roof with ceiling height of 2.1 to 3 meters. Supported by angle braces, slant beams form irregular portal structure together with posts, continuing to the back of the plot, allowing structure of narrow space without bearing walls which block the view. Under the condition of narrow frontage and curved shape of plot, unique interior scene was created with structure of shed roof section. When a roof is shed roof, the height of eaves must be fixed at the higher end of slant beam. By reinterpreting of the regulations, the height of eaves is fixed at the lower end of angle brace to give nearly one-meter clearance toward the ceiling, thus, floor level of owner’s residence is slightly raised to secure sight line of about eight-meter high. Angle braces have bare finish as they only bear short-term seismic force not requiring fire resistant covering, and it shows that the building is wooden construction. First and second floors are divided into four volumes used as apartment for rent, office of the owner, guest room, porch and warehouse, which are lined continuously with interspace called Grey Zone in between. Each volume is slightly smaller than compact houses in the neighbor and supports the residence of the owner on the third floor together. Four volumes standing closely to surrounding houses have minimum sized windows with figured glass to block view, and outer walls are finished with siding similar to the ones used by neighboring houses giving subdued expression. Grey Zones function as traffic lines to four volumes and balconies where windows with transparent glass have maximum areas to let in light indirectly inside the volumes while securing privacy. Residential development is said to have started in this district about 90 years ago when residential plots were large enough to have yard and large house. As time goes by, large houses were demolished and plots divided to smaller ones repeatedly to form highly dense residential area where the relations between the houses became delicate, ownership split in smaller pieces, and utilization of interspace between houses became passive. By implementing a scheme of space composition on the premises, we hoped to create a living environment with positive utilization of interspace where houses are highly dense and owners are diverse. 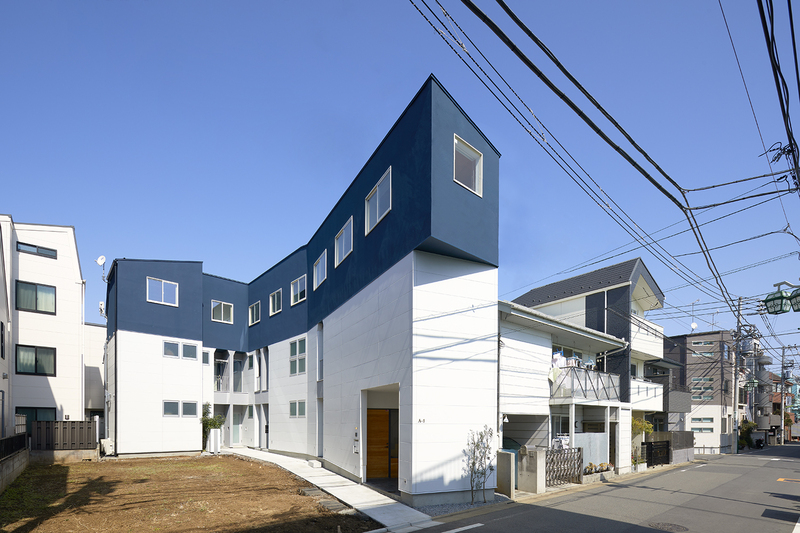 Residence of the owner on the third floor lying over four volumes is declaration of the ownership being integrated. Right after the completion of this project, the house on the east side was put on sale. The owner of the project had expected this at early stage and was determined to purchase at any cost. This is a determination of the owner to expand living environment proactively by implementing scheme of the newly completed building on the adjacent plot in a district where segmentation and densification of residence cannot be avoided. Half year later, the house on the east side purchased by the owner was demolished and land was cleared to start a new project.